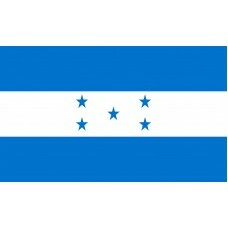 The flag of Honduras was based on the flag that was used for the Federal Republic of Central America that was in use from 1823 in the country when it joined the United Provinces of Central America. 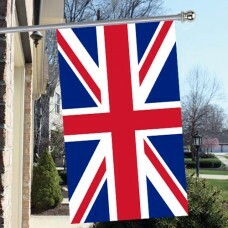 This flag consisted of three horizontal bands of color, two of cerulean blue, one at the top and one at the bottom, and a white band in the middle, all of equal width. It was amended in 1866 to include five stars, again in the cerulean blue color which were set in the shape of a cross on the central white band. Like many of the flags of Central American countries the two bands of blue represent the two seas that the country sits between, The Pacific and Atlantic (Caribbean), and white represents the land, the prosperity and peace of its people. 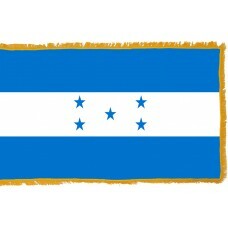 The added stars are to represent the former five countries of the Central American Republic - Guatemala, Costa Rica, El Salvador, Nicaragua, and Honduras. One of the key aspects of Honduras is its many water features, as well as the country's two coastlines. It also has a number of rivers, swamps, lakes, waterfalls, and hot springs, many of which are hidden in its dense areas of jungle. One of the most important of these water features is the The Mesoamerican Reef System, also known as the Great Mayan Reef which lies off its coast and includes the Honduras Bay Islands. This gives Honduras the honor of having the second most number of coral reefs in the world, just behind Australia which is number one. This vast natural phenomenon which stretches seven hundred miles down the coasts of Mexico, Belize, Guatemala, and Honduras is an important habitat for many types of fish, turtles, and sharks as well as housing a stunning array of different corals. It also takes in the mangroves of the coastal region which again support a variety of animals and birds and also help to protect the shores from hurricanes and storms. In contrast to the wealth of the seas off Honduras the country is also known for its extensive rain forests including the Rio Platano Biosphere Reserve, which in 1982 was added to the UNESCO World Heritage Sites. It is home to a number of endangered species and is one of the largest protected areas in the country covering 350,000 hectares. With such a bio diverse range of areas housing 6,000 plant species, 110 mammalian species, 700 bird species, and 250 reptile and amphibians it is no wonder that Honduras is one of the most ecologically protected regions in Latin America. 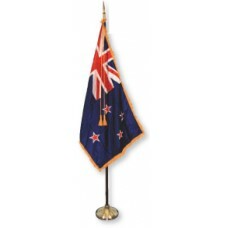 To date it has two biosphere reserves and twenty national parks. It is easy to see why so much importance is placed on both the land and sea and why the people of Haiti have chosen these to be represented on the flag of Honduras.